Click the three dots more icon to show the options next to the production run you want to base the reprint on. Click the duplicate link. The page reloads, and gives you new links. Click on this link to see your new production run. 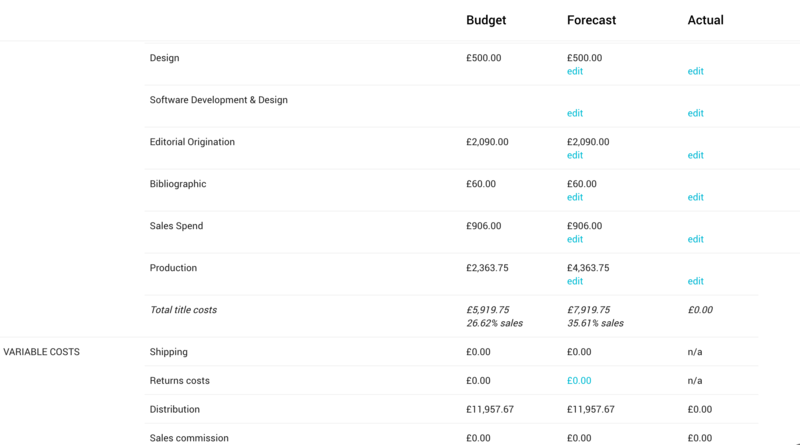 Check which finance codes are set up on this run by clicking on Project management > Finance codes. To add a production finance code, for example, click Add cost category and fill in the dialogue box that pops up. If the finance code list isn’t what you expect to see, then go to Settings > Configuration > Finance codes ⤴ and check that the ones you want to appear on every production run have got Include in auto set up ticked, and vice versa. Go to Costs > Cost estimates. Click on the numbers you want to change, and type the numbers in that you expect to see. The costs of the reprint will be added to the Forecast column on the P&L.